Cycling News Biking to Work is Fun, Easy, and Affordable, but That’s not all! Biking to Work is Fun, Easy, and Affordable, but That’s not all! Biking to work makes you happier. While most people would not identify sitting in traffic, navigating a congested city, or riding crowded public transit as activities that calm them down or make them happy, cycling to work can actually transform your daily commute into a moderate form of therapy. Numerous studies have shown that daily exercise can reduce stress, alleviate symptoms of depression, improve sleep patterns for individuals with insomnia, and reduce anxiety. Furthermore, exercising outdoors – both in urban and rural contexts – has been proven to boost self-confidence and improve overall mood. Biking to work makes you smarter. While it may not turn you into an astrophysicist overnight, research has proven that moderate, daily exercise can prevent cognitive decline, sharpen memory and learning, and improve overall brain performance. So even if biking to work doesn’t turn you into a Rhodes Scholar, at the very least it will make you better at your job. Biking to work saves you money. Lots of money. In 2015, the average American household is forecast to spend $1,962 on gasoline and motor oil. Shockingly, that would be the lowest average fuel expenditure in the US since 2009! Add on vehicle maintenance, the occasional repair, insurance, and the skyrocketing cost of parking, and you have an average yearly cost of $9,000 USD just to own a standard sedan in America. Conversely, a brand new commuter bike retails at anywhere from $250-$1,500 USD depending on the brand, style, and components you’re after, with an average yearly maintenance cost of around $50 USD. Unless you want to maintain your bike yourself, then it’s close to free! One-off purchases of a lock and lights will run you about $60-$200 USD depending on the quality. So even if you went for the most expensive options in each case, you’re still looking at savings of around $7,050 USD in your first year, with savings of up to $9,000 each year after that. Not a bad deal! Not only does biking to work save you money, it saves everyone money. A 2011 cost-benefit analysis of biking investments in Portland, OR, by the Journal of Physical Activity and Health determined that Portland residents could save between $388 and $594 million in individual health care costs by 2040 because of the city’s increased investment in bike infrastructure. Add that tosavings yielded by employers who invest in a company bike culture, the billions of dollars generated annually by the wider bike industry, and the economic benefits that strong bike communities bring to businesses, and you have yourself a solid financial case for hopping on a bicycle that even the most staunch defender of the automobile would have a hard time talking down. For you and others! The transportation sector accounts for nearly 30 percent of all US greenhouse gas emissions, with cars and trucks delivering nearly 1/5th of those emissions. While a solo driver in an average North American vehicle releases about 1.2 pounds of C02 per mile, the average cyclist releases only 0.7 grams through respiration. And while a bicycle’s life-cycle energy use including manufacturing and maintenance over a 15-year period is 60 kilojoules per Passenger Mile Traveled, the life-cycle energy use for a standard sedan clocks in at a whopping 4027 kilojoules/ PMT. That’s some serious energy savings with a seriously simple change. 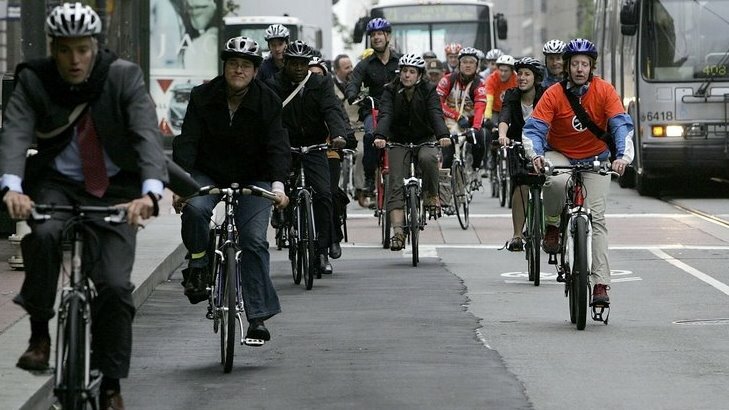 One of the most common misconceptions about biking to work is that it’s inconvenient. But what’s more inconvenient than spending 10 minutes looking for parking every morning or getting stuck in an unexpected roadblock on the way? When you bike to work, finding parking is as easy as spotting the nearest pole, locking up, and walking away. Cyclists don’t get stuck in traffic jams and aren’t susceptible to the usual transit delays of driving or public transportation, making bike commuting as fast or faster than driving for most urban commutes. Panniers and cycling bags make carrying your work materials easy, and many workplaces are now including secure bike parking, showers, and other facilities to make things even easier for employees who cycle to work. The more cyclists there are on the roads, the safer they will be. A 2008 study from the University of New South Wales determined that biking safety is a virtuous cycle. As more people ride in a given city, the number of collisions between drivers and people riding bikes decreases in absolute terms in that city. And this is not simply because there are fewer cars. Driver behavior actually changes to include safer driving practices when the number of cyclists and pedestrians increases. Because the perception of the relative safety of cycling improves with a decrease in collisions, more people then begin riding bikes. Virtuous cycle! For most kids, the moment that they first lose the training wheels and go flying down the road on their bicycle feels like freedom. It is a defining moment of many happy childhoods. Then the teenage years roll around and the car comes to define a new sense of freedom. But after a few years and far too many hours wasted in traffic jams or circling a city block looking for parking, the car begins to feel more like a prison. Toss off the shackles and find that feeling of freedom again. Explore the city at your own pace, try a new route, stop for coffee on the way to work and check out a new neighborhood on your way home. Cycling opens up avenues, both literal and figurative, to see your city in a whole new way. It’s your community, go live in it! Are you ready to put pedal to pavement and commute by bike?